Great little gadget for when you need to dice up a few veggies but don’t want to pull out the big food processor! 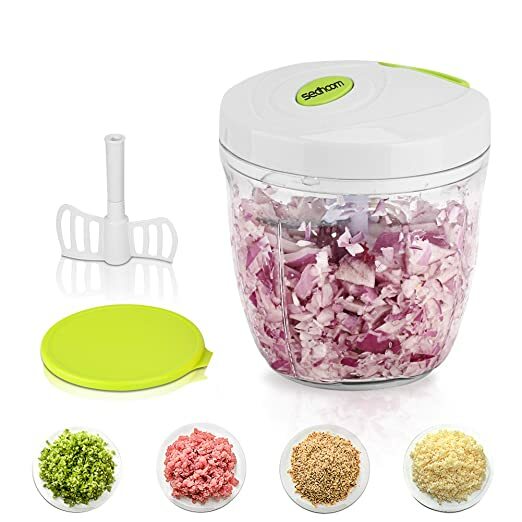 Snag this Manual Food Chopper 5 Blades for $14.96 – $8.98 with promo code SLICKFC4 = just $5.98 with FREE Prime shipping or free shipping with $35 purchase on Amazon! LIMIT 3 choppers at the discounted price in the SAME transaction! HIGH EFFICIENCY: Five sharp blades, perfect for chopping vegetables, dicing fruits, blending boneless meat and more. 1000 ml capacity, quite enough for kitchen use, travel and camping.